Ranging from Suncrest in the north to Mount Nebo in the south, Utah County has some of the best, most accessible, climbs in the state. It might not look the part, but the climb up the south side of Suncrest from Utah County has a bad reputation among many a cyclist. While locals often challenge themselves up the forgivingly wide road to the top, pros see the climb as a nasty reminder that their day is far from over. Though only four miles long and about 1,200 feet up, the climb is often accessible during the winter months and is a year-round training destination. Starting at the mouth of American Fork Canyon, cyclists begin one of Utahs most popular climbs. With a handful of gentle stretches and more challenging pitches, the canyon climbs past the Timpanogos Cave parking lots and several campgrounds and side roads. With several long straights, riders have the chance to enjoy the view as they turn their legs. After reaching the top, cyclists are given the chance to fill their water bottles at the hiking trailhead or simply turn around and enjoy the lightning fast descent. But be careful, more than a few roadies have overcooked some sharp turns and ended up with a nasty case of road rash. Climbing in Utah may not get much better than this. 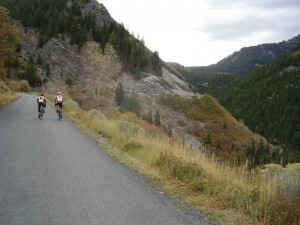 After a casual climb up Provo Canyon, cyclists are sent north on Highway 92. There are few easy spots along the climb but numerous views that can take your breath away. After passing Sundance a couple of miles up the road, the canyon climbs steeply into the aspen forests and presents stunning views of Mount Timpanogos as you roll through switchbacks. One might be lulled into a sense of false accomplishment when reaching the Cascade Springs turnoff, but theres still another couple of miles to go before the summit. Watch out for painted words of encouragement to Tour of Utah riders as you reach the top. After putting the hurt on yourself up Squaw Peak or the Alpine Loop, a semi-casual climb up Provo Canyons South Fork is a scenic and relaxing way to add on some miles or simply enjoy a low-traffic roll with friends. Departing Vivian Park and rolling past farms and campgrounds, the South Fork road presents a mild climb that pretty much anyone can enjoy at a conversational pace. A legend of sorts in Utah County, the Squaw Peak climb diverts off U.S. 189 just a mile or two up Provo Canyon and climbs a brutally steep pitch to a stunning overlook of the valley. The climb is fairly short in distance, but more than makes up for it in difficulty. Not the most well known climb in the area, the ascent of Hobble Creek Canyon is nonetheless one that shouldnt be left off any bucket list of climbs in Utah County. With nice pavement on the lower sections and some dirt roads at the top, Hobble Creek wont be for everyone, but if you want to ride a cyclocross bike or simply pack an extra tube or two you can escape the more crowded paths in the valley. Looking for a long, grueling climb? Try the ascent to Soldier Summit up U.S. Highway 6. Though fairly heavy with automobile traffic, the highway has a decent shoulder (but be aware of the rumble strips) and will force you to keep your legs turning mile after mile. Its a long steady climb, but one heck of a way to relax as you come back down. Starting in Payson, one of Utahs most iconic climbs is a brutal test of endurance that rewards riders with magnificent views and a well-earned descent either back to Payson or down the south side towards Nephi.